When the action is hot — when you need to capture more than a moment (and maybe the sounds) — you switch the Droid Bionic camera into Video mode. Video chores on the Droid Bionic are handled by the Camcorder app, found on the App menu. It’s really just the Camera app, but in Video mode. In fact, you can switch between Camera and Video modes in either app by using the Switch To command, shown in this figure. 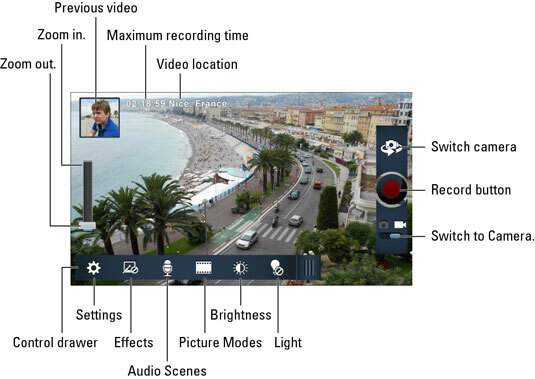 The Camcorder app is illustrated in the figure. Start shooting the video by pressing the Record button. While the phone is recording, the Shutter button changes to the Stop button. The Mute button appears on the touchscreen. Use it to mute sound recording. To stop recording, touch the Stop button. Hold the phone steady! The camera still works when you whip around the phone, but wild gyrations render the video unwatchable. The video’s duration depends on its resolution (see the next section) as well as on the storage available on your phone. The maximum recording time is shown on the screen before you shoot (refer to the figure). While you record, elapsed time appears. In addition to the zoom controls on the screen, you can use the volume controls to zoom in or out as you record video. Visual effects (the cheap kind, not the Hollywood CGI kind) can be applied to the video. Touch the Effects button on the Control Drawer to review the available visual effects. Recorded video is saved in the phone’s storage — primarily, the MicroSD card. You can change this location by dragging out the Control Drawer and touching the Settings icon. Choose Storage Location, and then choose either Internal Phone Storage or SD Card. The video is stored on the Droid Bionic using the 3GPP (Third Generation Partnership Project) video file format. The video files are located in the DCIM/Camera folder and have the .3gp filename extension. It’s easy to make a self-shot video on the Droid Bionic, thanks to the front-facing camera. The secret to recording yourself is to touch the Switch to Camera button, shown in the figure. As soon as you see your face on the touchscreen, you’ve done things properly. The front-facing camera uses only VGA resolution, though it’s ideal for attaching to an e-mail or text message. You don’t need a flash when recording video, but occasionally you need a little more light. You can manually turn on the Droid Bionic’s LED flash to help: From the Control Drawer, touch the Light icon. Choose Light On to turn on the LED light on the back of the camera. Turning on the LED light consumes a hefty portion of the phone’s battery power. Use it sparingly.